CMHC Housing Market Update – First Swiss Mortgage Corp. | Alternative mortgage lender for debt consolidation, equity take out and purchase assist loans. CMHC today released its Fourth Quarter 2013 Housing Market Outlook report, which indicates a balanced market that will continue moving along at a steady pace. While building activity picked up in recent months and CMHC increased its housing starts forecast for 2013 to 185,000 units, construction activity is not expected to rebound to peak levels of 2012 when 214,827 units were built. Going forward, CMHC expects improved building activity in the low-rise sector while multi-family starts are expected to continue to decrease into 2014. Housing prices in Canada are expected to be up 4% year-over-year for 2013 to $378,000, followed by 1.9% growth in 2014 to $385,200. 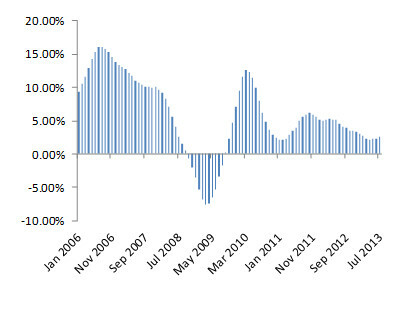 For the meanwhile, CMHC expects housing price growth to be in-line with inflation. Total volumes of resales through MLS will be flat in 2013 at 456,700 units and are expected to increase 2.5% to 468,200 units in 2014. Resale market activity for 2013 is being driven by strong gains in the second and third quarters of this year. Housing prices in Ontario are expected to average $398,000 in 2013, which is up 3.5% from the prior year. The pace of growth has been declining with each year and is expected to match the rate of inflation in 2014 of 1.6% to reach $404,200. Given the recent rise in house prices, CMHC expect a shift in demand to more moderately prices homes such as row-housing and townhouses will dampen the growth rate of the “average” price. After declining 2% in 2012, unit resale activity in 2013 was up 0.5% to 198,700 driven by a pick-up in the second and third quarters of the year. In 2014, CMHC expects total resale activity to increase 1.3% to 201,300 units, driven by strong performance in the first half of the year. Housing starts are expected to end the year down over 20% at 60,800 units following rapid expansion in the last few years. Slower construction growth is impacting the overall Ontario economy as indicated by the recent August GDP figures. This decline can be largely attributed to multiple-unit starts (condos), which will be down 27% in 2013 to 37,300 units and will continue to decline into 2014. Breaking down Ontario into its submarkets, Thunder Bay and Brantford are expected to perform the best in 2014, with forecast price growth of 4.2% and 3.0% respectively. 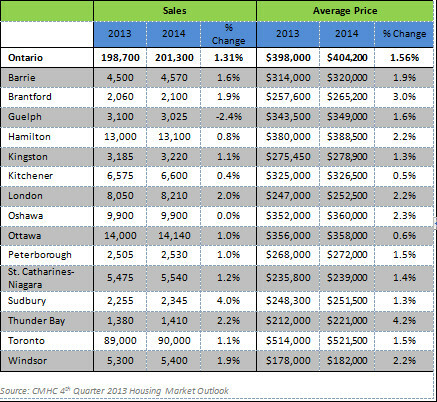 They are followed by Oshawa, Windsor, Hamilton and London, which will see price growth over 2%. The rest of the major markets are expected to see growth in the 1% range.